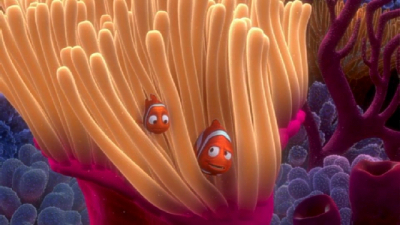 "...and the sea cucumber turns to the mollusk and says, 'With fronds like these, who needs anemones?'" "All new explorers must answer a science question. You live in what kind of home?" "An anemonemone. Amnemonemomne." "That's okay kid, don't hurt yourself." "flowering plant genus, 1550s, from Middle French anemone (16c.) and directly from Latin anemone, from Greek anemone 'wind flower,' literally 'daughter of the wind,' from anemos 'wind' (cognate with Latin anima; see animus) + -one feminine patronymic suffix. According to Asa Gray, so called because it was thought to open only when the wind blows. Klein suggests the flower name perhaps originally is from Hebrew (cf. na'aman, in nit'e na'amanim, literally 'plants of pleasantness,' in Is. xvii:10, from na'em 'was pleasant'). Applied to a type of sea creature (sea anemone) from 1773."